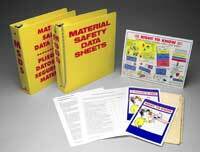 Title: 06/10/1988 - Clarification of Material Safety Data Sheet Requirements Under the Hazard Communication Standard. As you will recall, at the Chapel Hill meeting the State of Washington inquired about the intent of the attached October 9, 1987, memorandum form Thomas Shepich, Director of Compliance Programs, on Material Safety Data Sheets (MSDS) required under the Hazard Communication standard. The memorandum addressed whether a MSDS format must include blocks or spaces for information that is not applicable or available for the substance involved. This question had been raised particularly by manufacturers that use computer-generated MSDSs. It is customary to exclude fields on such MSDSs when there is no information. Since the standard is performance-oriented and not MSDS format is specified, employers are free to develop MSDSs that are designed for a specific chemical. For example, if an employer develops an MSDS for a chemical which is not a carcinogen, a space addressing carcinogenicity does not have to be provided on the form. This policy applies to any type of MSDS including computer-generated ones. Of course, if a format is used which has a space addressing carcinogenicity or any other information required under the rule, it must not be left blank under any circumstances. We hope this adequately clarifies OSHA's position.